2012: $18 million, fully guaranteed. 2013: $20 million, everything guaranteed unless there is a neck issue. 2014: $20 million, everything guaranteed except for neck. 2015: $19 million, not guaranteed. 2016: $19 million, not guaranteed. It is clear that Peyton Manning made concessions for his neck issue. Total: 5 years, $96 million; $58 million in guarantees; $18 million in full guarantee. He had a $26.4 million full first-year guarantee in his previous contract with the Colts, so he did drastically reduce his asking price. 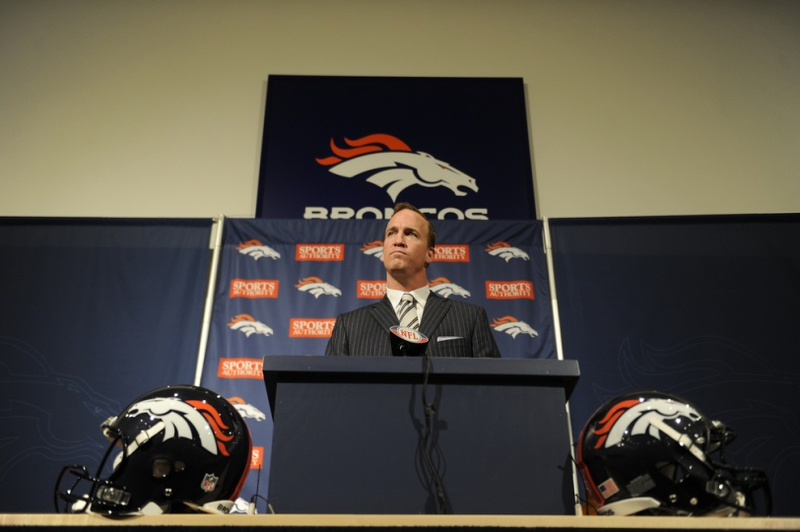 "They’ve got to be protected,:" Manning told the Denver Post. "That’s why the whole medical — I was as open book as I could be. I told them exactly how I feel, what I was working on. They have to know everything to make their decision. "Even today at the last minute I said, "John (Elway), put it the way you want it … he and I talked about that from the get-go, on that first visit. You don’t to start off on a bad foot. I kind of argued with them a little bit — on their side. Nobody believes that when you say that. But it’s got to be what they’re comfortable with." Manning said there is still some nerve and strength issues but doctors told him he would completely recover. Monday morning, Executive Vice President of Football Operations John Elway and Head Coach John Fox were sitting in an office, discussing personnel issues. Elway's phone rang. Peyton Manning was on the other end. 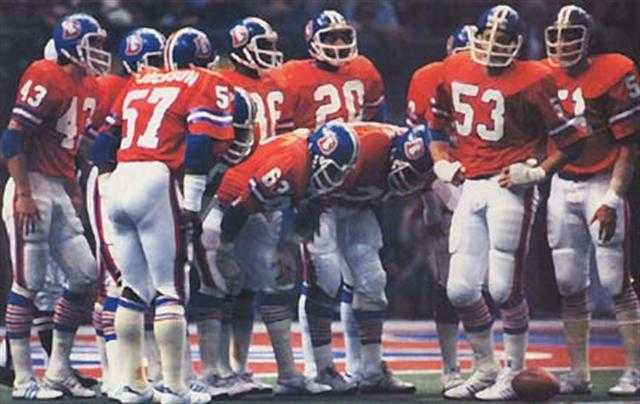 "We both froze," Elway recalled. "I stepped back like it was a hot potato," Fox laughed. The Pro Football Hall of Famer answered the call, and asked the future Hall of Famer how he was doing. "It has kind of been a rough morning because I've had to call these other teams and say that I’m not going to go to work for them," Manning said. Elway couldn't help but wonder whether the Broncos were one of the teams on that list. 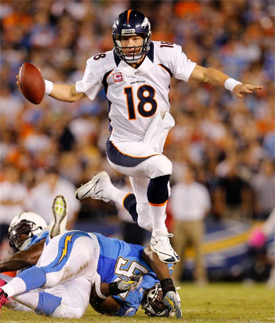 But Manning quickly eased that tension. 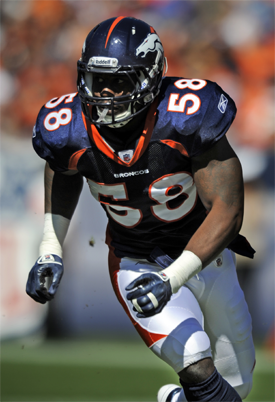 "I just wanted to tell you that I want to come play for the Denver Broncos," he said. Elway gave Fox a big thumbs up, and the head coach began jumping around the office, trying not to make too much noise while the phone conversation came to a close. "As it became evident we were his choice, it was pretty boisterous," Fox said. "It spread fast in our building as far as people running around, very excited -- a lot of congratulatory emotion." From there, the contract negotiations began -- a process Elway described as "rather seamless" -- and Tuesday the deal was officially signed. 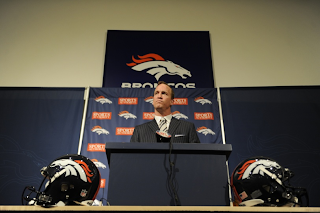 Peyton Manning introductory press conference. Here is the notes I took away from the press conference that was held today. 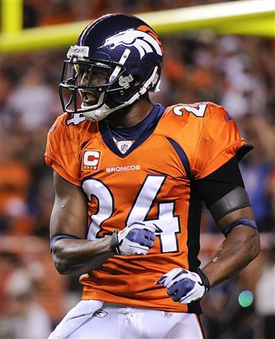 The first thing I see is the Champ Bailey 'Child Please' picture in the back ground. That makes me smile. 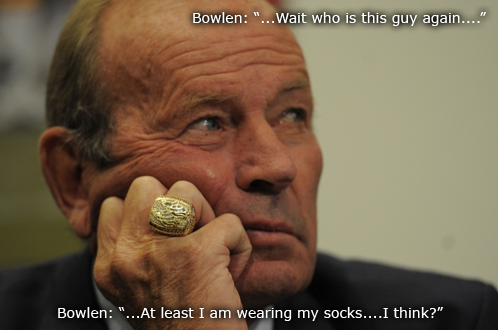 Bowlen is up first and takes the stage. He is looking great but his speech isn't. It is slow and he reads his notes the whole way through, doesn't come across as overly excited. He didn't smile once during his introduction. It is a little sad to see him like this. Hopefully we can win a Superbowl for him. Elway is up next. He is super happy and excited but Elway always lights up a room. 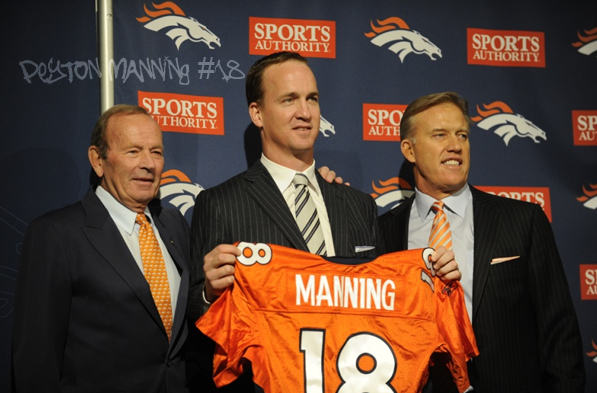 Elway believes Manning will be here for a long time. He hands over to Manning quite quickly. Manning up next but they pause for photos first. Bowlen is smiling and happy now. 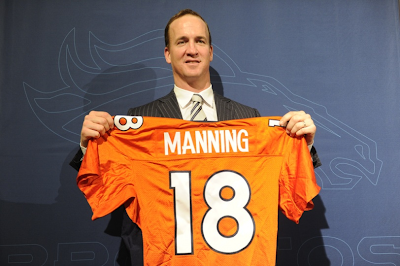 Peyton Manning will wear number #18 for the Broncos. He had a long conversation with Frank Tripucka about wearing the number and Frank urged him to wear it out of respect for him. It is an honor for Manning to wear the number and it was Frank's wish. Manning would not turn down a request like that. I hope it doesn't have bad consequences in the future. 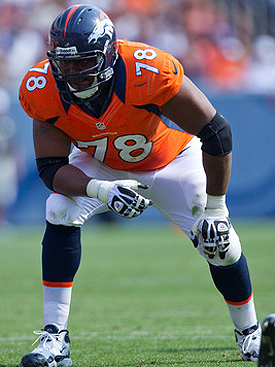 Broncos were a great fit for him. He has a lot of respect for Elway. The Broncos is a great place to be. Very comfortable - it was Manning's favorite new word during the press conference. He took a long time to make a decision because he wanted to make the right choice. He said a year off has made him really want to work and helped his body recover. Elway will do everything he can do to win. Manning looks great for 35-36 compared to say Favre and Elway were at the same age. Manning keeps saying he has a lot of work to do on his neck. He wants to get back to where he was before he was injured. I would say that is 100%. All the doctors and trainers he has meant are encouraged by his progress. It was 15 minutes before the first Tebow question was asked. His family is excited about the move. 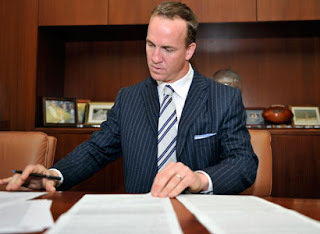 Peyton loves his history, he has gotten to know some of the Broncos history in his short time with us. He wants to turn the year off into a positive. Manning is loving some DT, he can't wait to work with Bay Bay. The Manning face will take some getting used it. This is a now situation! Win now! Peyton says he was an open book through out the whole process, he had nothing to hide. He looks generally happy to be here. He couldn't be happier about the choice. Manning says the process has been hard and different, it was very public too. His choice had to feel right, that gutting feeling I have been talking about. Another video the Broncos had on their website. Elway said he was relieved. Now it is time to continue putting the pieces together. He said you have to have an interest in a guy like Manning. Stayed in touch with him through the whole process. Both sides were very honest and open with one another. It was a fair deal on both sides. That there would be a fast learning curve between both sides. Trying to get Bunkley signed. Continue to try and get better as a football team. Punter Colquitt makes an appearance in this video. Enjoyed talking football with the offensive staff. Known Champ for years and has a lot of respect for him. Champ and Doom have been blowing up Manning's phone all week long. It sounds like Tebow good be gone as soon as tomorrow at lunch time. The two interested teams are reported as the Jets and Jaguars. Also they are offering a 3rd round pick for him. That is all from today. Stay tuned tomorrow as the saga continues ~ Aussie. Looks like the Tebow trade has gone down, we think. Also we lost Bunkley to the saints which is a huge blow. Bit surprising since the saints won't have a coach this year. So looks like we maybe targeting dt in the draft. Not the greatest day in broncos history. Well looks like the jets trade fell through, I hope the jags get him because I think the jets would ruin him. Maybe jags offer up some more picks! But his value is still not great. I wonder how the princess is handling this? Tebow to the Jets is back on! Gonna continue to wear my Tebow jersey in protest of this colossal mistake. Denver will regret trading him away, guaranteed. And I hope Tebow b****-slaps them right back for doing so. Haha totally agree with your statement. Pissed, but I felt the same way when we traded Cutler. Manning is a great player but risky but we don't know where we will be in a few years time. Who knows maye we find our own Tom Brady. I really dislike the trading of Tebow. He is a great kid but got screwed over here. Plus I don't like the trade to the jets. Remember that Elway is in the business of players not people. Hence why Tebow was let go for manning. Tebow may or may not be the answer. He could crash and burn or be great, who knows? Atleast the Broncos are still here and will always be, time will tell if this was bad or good. Hindsight is great. For now we must kept on trucking. Atleast you can't say the Broncos ain't enteraining. I will say more when I get home, bit hard from the phone.